The Budget Ordinance is the county’s financial plan for the next fiscal year, which begins July 1, 2017. It determines how much money each department receives to provide services such as fire and police protection, public transportation, water and refuse collection, and how much is collected from the public through taxes and fees. Testimonies are uploaded by batch in the order they are processed by staff. Actual date of receipt is noted per file name. The Budget and Finance Committee will hold evening meetings throughout Maui County next month to receive community input on the Fiscal Year 2018 budget. March 30, Kihei Community Center, 303 East Lipoa St., Kihei. April 3, Lanai Senior Center, 309 7th St., Lanai City. April 5, Mayor Hannibal Tavares Community Center, 91 Pukalani St., Pukalani. April 6, Paia Community Center, Hana Highway, Paia. April 10, Mitchell Pauole Community Center, 90 Ainoa St., Kaunakakai. April 13, Helene Hall, 150 Keawa Place, Hana. April 17, Lahaina Civic Center, 1840 Honoapiilani Highway, Lahaina. April 18, public hearing at the Council Chambers in Wailuku. All meetings begin at 6 p.m., except for Molokai with a 6:30 p.m. start. Testimony will also be accepted at any of the posted meetings in the Council Chambers throughout the deliberations and decision-making process. 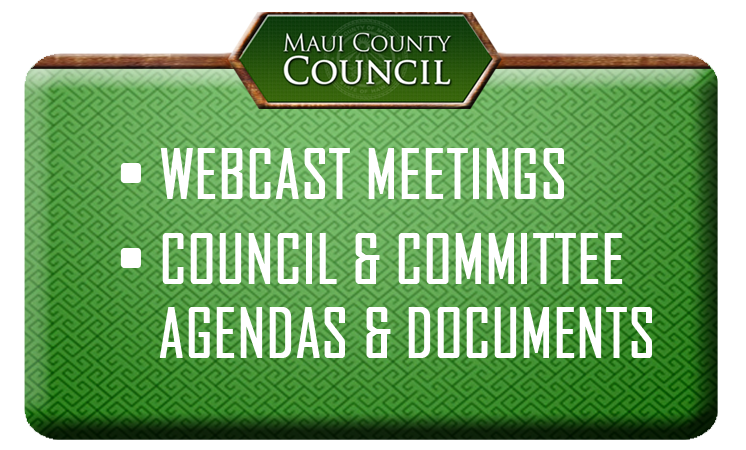 Each meeting agenda will be available at MauiCounty.us/agendas and testimony will also be accepted via email at bf.committee@mauicounty.us.